Auracle is a fresh power metal band from the Netherlands, founded several years ago by keyboardist/composer Joris van de Kerkhof and bass player Fred Hasselman as a studio project named Mythica. After releasing one demo, the project underwent a few line-up changes before adopting their current moniker and releasing Crystal Lies, a two-track demo intended to attract label and venue attention. A goal of the founding members was to create robust power metal with Arabic and Asian atmospheres. Such an atmosphere is certainly present on Crystal Lies, particularly on the title track. The band's sound relies heavily on the keyboard skills of Joris for the bombastic, orchestral feel that enshrouds the clean guitars and precise drum beats. Complete with a strings section, horns, and more exotic instruments like the sitar, Joris' orchestration lends a bit of a movie soundtrack quality to the music. Obviously the keyboards are very prominent in the mix, but they leave plenty of room for some deep bass lines from Fred and solid riffs from Niek van Doorn, as well as the previously mentioned drum work of Marco Verberne. The vocal duties of Auracle are shared between Bryan Ketelaars and, on this demo, Elizabeth Cordia (ex-Annatar). Though at first glance comparisons to bands like Nightwish and Epica seem appropriate, Auracle shy away from the operatic vocalizations and instead rely on their singers to create a much softer, more accessible sound. Bryan has a slightly gravelly voice that compares with Hansi Kürsch (Blind Guardian) and Jonny Lindkvist (Nocturnal Rites), whereas Elizabeth is on par with such metal divas as Liv Kristine (Leaves' Eyes) and Anneke van Giersbergen (The Gathering). Bryan has the lion's share of the vocal parts, but his interaction with Elizabeth provides a pleasing contrast and works well to enhance the enjoyability of the songs. 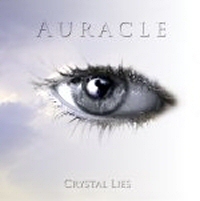 Crystal Lies provides an intriguing taste of what Auracle is capable of producing, and definitely leaves the listener wanting more. While their style of power metal isn't quite groundbreaking, the musicianship is first rate and the vocals are excellent. Since the demo was released, Elizabeth has left the band and was replaced by Amelie Mangelschots. Assuming Amelie has a vocal style similar to Elizabeth's, the future work of Auracle should remain as good as that shown on this demo.